Designing an application for the foundation that helps youth grow and lead. The Amala Foundation in Austin, Texas offers social and emotinal learning (SEL) programs for all ages with an emphasis on youth. Since opening in 2001 they have served over 6,000 youth and helped them grow as leaders and human beings. 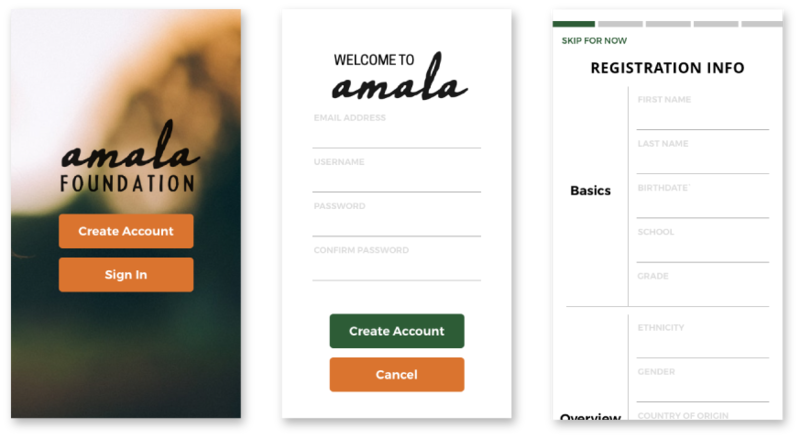 With Amala building a strong community they wished to also grow their online community with a mobile app and wanted to find the best solution to connecting and serving a growing online community. These findings were important as it showed that while the Amala Foundation serves all ages, an emphasis on the benefits of serving the youth in their community was clear and this younger group became the target user moving forward. Meeting with one of the founders and leads of the Amala Foundation helped to better understand the foundations goals and apparent pain points. Insights from the interview contributed to the creation of a feature list to match the clients goals as well as revealing what areas of the current online platform had difficulties, specifically the registration process for program enrollment. Working in line with the “Sprint Design” process, the clients’ goals were laid out and a list of questions & assumptions were created in order to focus on which aspects or features needed the most attention. To make an easier enrollment in Amala programs. • When is the best time to gather registration information? • Do all programs require payment ahead of time? • At what stage is Admin communication needed? • What roles and updates to Admins need? In order to visualize the users journey, a User Map was created to understand how to better design the interactions that could guide and help users find what they need. A central focus in the planning was making an available program list more transparent to the user and to also help streamline the lengthy program registration process. 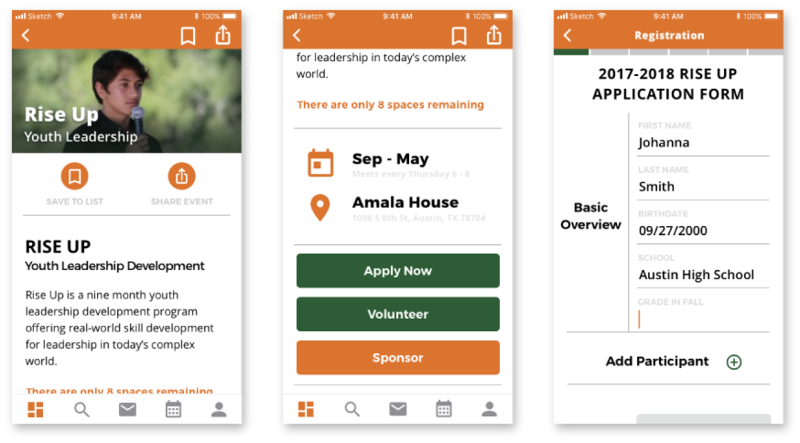 Wireframe exploration helped explore the strategy and solutions for an Amala Foundation mobile app. The app is intended to act as entry for users to explore the Amala community of programs and events. A more connected community can be created through direct administrator communications and a forum system within program/event pages. A simplified registration system is shown in the storing of relevant information so user is no longer required to re-enter their data for every program enrollment. After iteration, decisions were made on which functions were most appropriate and a prototype was created to validate these decisions. The prototype included the experiences and interactions that members of the Amala Foundation found most important and which would help to answers the original Questions & Assumptions. These points included a sign-up registration process, profile for storing user data, messaging and update section for Admin communication and streamlined event registration process. The first time entry into the app starts the user with the creation of their profile. Here, the user is prompted with the option to fill out their basic information for program registration if they wish. Once the user creates their profile, they are presented with a cultivated list of event categories and their relevant programs. Within the program screen the user can find more detailed information on the program, the programs member forum, and options for joining or contributing to the program. When entering a programs registration process the user is presented with a staged enrollment process. Stored information is automatically inputted into the relevant fields where applicable and the user is shown their total progress through the registration. Keeping track of user information was key to streamlining the registration process, but feedback notes led to the addition of the “Participants” section so that Guardians can also store there children's info in order to enroll for them. The Amala Foundation wanted to ensure a direct line of contact with their members in order to keep them updated with the most relevant info. The inbox helps serve this function as well as allowing messaging between registered members. According to the Amala Foundation, many people enjoy returning to reoccuring events. The activity log keeps a record of past events for users to more easily re-register as well as keep track of their upcoming registered events.